overseas January 7, 2016 12:00 p.m. 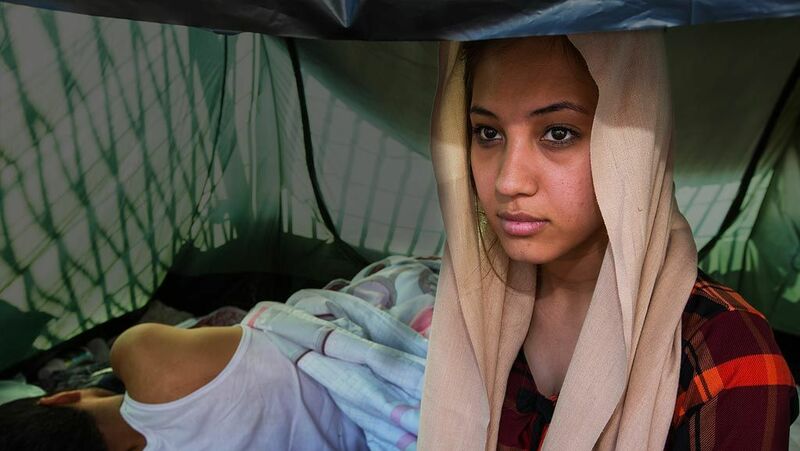 In this year's massive human migration to Europe, some young women have been forced to make the journey alone. 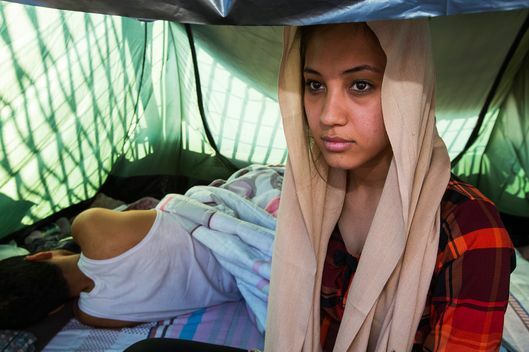 In this year’s massive human migration to Europe, some young women have been forced to make the journey alone. Syrian refugees (not the sisters featured in the story) photographed in Lesbos in September. Everyone from Daraa, a city in southern Syria, knew the desert route to Turkey passed through ISIS territory. The sisters had been warned that they would be stopped at a checkpoint where ISIS would interrogate the men, searching for anyone with connections to the Assad regime or the Free Syrian Army. Women, they were told, would not be questioned or searched. Two days into their journey from Daraa to Germany, part of the massive wave of refugees fleeing the war, the sisters — Shams, who is 21, and her younger sister, Maya, just 17 — reached the first ISIS checkpoint, an ordinary house in As-Suwayda province in southwestern Syria. The women and children were shepherded inside, where they found other female refugees, while the men stayed outside in the yard. An older woman in a niqab had told them to wait there for another car that would take them into ISIS territory for the men’s interrogation the next day. It was late, and the sisters, exhausted from traveling, went right to sleep. The next morning, one of the women they had slept next to asked the sisters if they were traveling with a mahram, a male relative of one degree, like a father, brother, or son, as is required under ISIS’s martial law. Otherwise, the woman said, they would be forcibly married to an ISIS fighter. Shams didn’t know whether to believe the woman; there were so many rumors. She took Maya and went outside to find the woman who seemed to be in charge. They called her Um Mohammed. “Do we have to have a mahram?” Shams asked. Shams had to think fast. She said they were with their brother and pointed to Hamza, a boy from their old neighborhood, just 17, who was making the journey alone. Before they left, his mother had pleaded with Shams to keep him safe. Now she needed him to protect her. Um Mohammed hadn’t seemed to notice the sisters before. Now that her suspicions had been aroused, she wouldn’t leave Shams alone. She kept asking about their travels, engaging her in conversation. Hamza agreed, but it was clear he was nervous. Shams could feel Um Mohammed’s eyes on her as she spoke to him, so she started speaking loudly about how their father had just called to check on them. On their way to the next house, Shams came up with their backstory: The three of them were traveling to meet their father in Turkey. Hamza passed Shams his official IDs so their interrogators wouldn’t see his family name. He promised to tell ISIS he lost them. When they arrived, Hamza was taken away with the other men. Shams and Maya were taken to a different house, where for the next week they would live with 17 other women, four from their smuggler’s group. They were not allowed outside, so instead the sisters sat with the other women for hours, worrying Hamza would slip up or get beaten and crack. “Insha’allah, he won’t speak, insha’allah, he won’t make a mistake,” they whispered to each other. They were required to wear two layers of clothes, including special socks and gloves to cover their hands. Their ISIS handler would show up unexpectedly to check on them, shouting at the women for not complying and looking indecent. Shams decided that when she got to Germany, she would take off her hijab forever. No one could tell them why their detention was taking so long. The sisters were terrified, barely able to concentrate on anything. They worried over what Hamza might accidentally say, whether he’d be harmed. On their seventh morning, they were finally released, without explanation. They saw Hamza briefly as they were leaving the ISIS detention, when the militants reunited the women with their mahrams, before loading them onto a bus — women in the back, men in the front. After hours of traveling, by bus and then by car, the smugglers let them out and told them to start walking. The three of them hiked across a mountain in the middle of the night to the Turkish border. Putting themselves in that kind of danger is not an experience the sisters could have imagined before the war. Growing up, they usually were accompanied by their parents when they went out. They hung out at home and in the homes of their girlfriends. Talking to unrelated men or boys was discouraged. But now here they were, negotiating with male smugglers and sleeping in hotel rooms and camps with men they didn’t know. Their mother had spent the summer floating the idea of sending them to Europe, but the final decision had been sudden. One night in September, a shell hit the family’s building as they slept, and their father made up his mind. They had been displaced inside Syria nine times in three years. No matter where they went, there was no future for his daughters in this country, no real education, no hospital he could bring them to if something happened. That morning their father spoke as if possessed. He told them they had to, had to, absolutely, immediately get out. If everything went well, he and his wife and son would follow them later. While Shams obsessed over what she was packing, Maya was sure their father would change his mind — their parents wouldn’t really send their two daughters alone on the dangerous route. Neither had been outside of Syria before. Even when she heard her parents telling Shams, who had always been the responsible oldest sibling and the family’s star pupil, that she would now be in charge of navigating their new life, Maya didn’t believe it. It was only when Maya saw the minibus that she understood it was really happening. The journey would be both a final departure from the life they imagined as children and the starting point of an adulthood so foreign they were unable to articulate their expectations — preferring, as Maya told me, not to have any. I met the girls three weeks in, at a small camp in southern Macedonia near the town of Gevgelija next to the border with Greece, where they were resting before they attempted the final leg — the taxicabs, bus rides, and trains that would take them through the European borders. Shams is tall and slender with clear brown skin and delicate brown eyes. In her third year of university, she was majoring in French literature but sometimes daydreamed about being a flight attendant so that she could see the world. Maya is shorter, more athletic. In Syria, she had been the more social one, calmer and less headstrong. Still in high school, Maya wants to be either a doctor or a journalist. Growing up, Shams preferred to spend her time at home with her mother, whom she considers to be her best friend, while Maya loved to hang out with her girlfriends, gossiping and joking around — about each other, about boys, about life. Neither sister had ever had a boyfriend. Both spent what should have been their most carefree teenage years under threat of Bashar al-Assad’s barrel bombs, at the mercy of rebel militias and the encroaching threat of the Islamic State. The girls hadn’t covered their hair until last year, when they were displaced to an area controlled by a Syrian affiliate of Al Qaeda, then both Shams and Maya began wearing a hijab for their safety. Their mother was still unveiled. She was the one who had insisted they bring their coats with them: Shams’s red peacoat and Maya’s olive-green padded parka with a faux-fur trim. The sisters hadn’t wanted to take them. It was still hot in Daraa when they left. They had debated throwing them away in Turkey, but they couldn’t bring themselves to disappoint their mother. Now they were grateful to have them — it was cold, and they were so sick of the clothes they’d been wearing, they had zipped up their jackets. “We can’t look at ourselves anymore,” Shams said. As we sat on pieces of cardboard outside a white plastic tent at a U.N.-run camp, they told me about being held by ISIS and what happened after. They’d hiked across mountains for hours in the dark, until they reached the Turkish border. They were still wearing their abayas — they’d had no time to change — and tripped over the ankle-length fabric. They were separated on the way, and when they reached the border town of Reyhanli, they were exhausted and dirty. Yet they couldn’t help but laugh at the symmetry: Each of them had lost one of their shoes and thrown the other away. Young people in life-altering situations are still young people. Even while navigating the perilous route they still laughed, flirted, fretted about their appearance, and worried about school. Barefoot in the bus station in Antakya, they spent the first morning in Turkey searching for shoes. They bought identical blue Converse knockoffs before continuing by bus to Izmir, a city on Turkey’s Aegean coast. It fell to Shams to find them boat passage to Greece. Their father had given the girls $6,000 to pay smugglers. The sisters split the money in half, rolled the wads into plastic bags, and hid it in their bras. They were less worried about being robbed and more concerned the money would somehow fall out, so they would constantly adjust their shirts, as covertly as possible, to make sure it was still there. Before Shams knew it, she had become responsible for a small group. Along with her sister and Hamza, there was Lamia, a neighbor from Daraa with three children. Her son and her husband were already in Germany, so she was traveling alone with her two daughters, 9 and 3. She had latched on to the sisters, relying on Shams to negotiate with the smugglers and help her look after the children, even though Lamia was twice her age. Their family friend’s son, Mohammad, 26, had also joined their group. The sisters thought it might be helpful to have an older male companion, but Mohammad had proven unwilling to lead them. The burden weighed on her, and Shams couldn’t help her thoughts: All these lives are in my hands. What if the boat is defective? When her mother called, Shams confessed that she was overwhelmed. Her mother told her to be patient. She would pray for her. It took five days for Shams to arrange their travel. Boarding the boat, she thought about the dress she would have to throw overboard if they had to bail. It had a denim bodice and a full red skirt with a leather belt that she matched with a white-lace bolero. She’d bought the dress with her mother in Damascus over the summer and never gotten to wear it. It was impractical to bring it, but it was too nice to be left behind. She had resolved to wear it once before she died. As she made her way onto the rubber boat, she thought, at least she’d worn the dress once in Izmir. Their boat began to sink quickly, while they were still near the Turkish shore. They turned back and slept on the beach, cold and wet. The next morning they went back to Izmir to wait for another boat. Their parents were horrified. “My aunt called me and said, ‘Come back. Your mother is about to have a heart attack, she’s so worried,’” Shams told me. But three days later, the sisters’ group set out again. This time they made it to Greece’s Samos Island, their entry to Europe. Shams got a huge black-and-blue bruise on her left leg where she’d slammed it walking up the stairs of the ferry that took them to Athens. When I met them in Macedonia, her leg was so swollen she had trouble walking. But there was no time to rest. They’d joined up with a loose conglomerate of about 25 refugees. They would follow the crowd to Germany. That evening, we stood in long lines inside the Macedonian camp, waiting for the train that promised passage to the Serbian border. Some had wrapped themselves in gray UNHCR blankets against the cold. We were among the last to board the train, which was so packed we had to stand between the carriages by the bathroom. By the time the train started to move, Shams and Maya had been given seats next to Lamia. Maya soon fell asleep on Shams’s shoulder. Lamia’s 9-year-old daughter slept on Shams’s lap. The women looked uncomfortable, while most of the men had begun to sprawl, spreading their legs into the aisle. “Many of the men have lost their courtesy,” Shams told me later. Yasser, a 27-year-old man from Hama, was seated on the floor diagonally below Shams. Eventually, they started talking in whispers. “Why did my SIM card stop working?” Shams asked him, head tilted. Yasser straightened as he told her about roaming. “As a woman you should go outside the big cities. They will give you a nice country house in a rural area. Processing will be faster,” Yasser said confidently. They compared notes on the trip so far. Shams told him a story about ordering a pizza in Greece that had pork on it. They ate it without knowing. Yasser laughed. Shams smiled. “Are you married?” Yasser asked. After a while, everyone went silent, and Shams too fell asleep as the train rolled through the darkness. When I asked her later how someone who spent most of her time at home with her mother knew how to flirt so well, she gave me a look. “I know how to handle myself,” she said. The train pulled into the final station in Macedonia after midnight. It was drizzling. There was a bonfire. Shams thought they would sleep in the camp by the station, but instead their group pushed on to the Serbian border, walking in the dark to a refugee-designated crossing in a field, where my translator and I had to leave them. When we met the sisters again at their temporary accommodation in western Germany, they had just had their first real night of sleep since leaving Syria, and their first shower in a week. They hadn’t removed their hijabs since they’d left Turkey — there had been no place without men around where they could. Shams had tried to comb out the tangles in her long hair that morning, but one clump had been impossible. She showed me her prized dress. “It still smells like Damascus,” she told me, laying it gingerly on her bed. Shams was still wearing a green paper bracelet the Austrians had distributed before they crossed into Germany. She was afraid to take it off, lest the Germans somehow change their minds, so she had showered delicately that morning so as not to damage it. We went for a walk through a nearby park. The grass was green and lush, the air moist with impending rain. Germans were playing with their dogs. Shams had decided she didn’t want to continue studying French literature. She had never really liked it. Maybe she would study tourism. She wanted badly to learn English. We walked to a crowded coffee shop, and I ordered us tea and cakes. Shams noted that the sugar in Germany didn’t taste the same as it did in Syria. It wasn’t as sweet. I asked if it felt weird to finally be here. The foreignness didn’t bother her, Maya said, but not being able to communicate was hard, and of course they missed their parents. We walked back to their apartment and promised to stay in touch. When I called a few weeks later, they were still living in the temporary housing. Shams was cooking breakfast, trying to make it as similar to Syrian food as she could with the ingredients they found nearby. Maya had registered for German classes. Shams had thrown away the green bracelet and everything else from their journey. “I don’t want anything to remind us of that trip, of the desperation we went through,” she said. I asked how she felt about the trip now. “It feels like it’s not something that happened to me. It’s like a dream,” she said. Sometimes the sisters wake up and think they are still in Syria. Over the next few weeks, we exchanged WhatsApp messages with smiley faces about their progress. Shams told me she had made some new friends in the camp. Then, after the Paris attacks, I couldn’t find them online. Shams’s German phone number was switched off. I knew that phones and valuables could easily get lost or stolen at the camps. The mass wave of refugees undulates without warning, and to survive the two young women had to be flexible.